MAKE BEST OFFER! FREE 1-3 DAY DELIVERY! 30-DAY RETURNS! Specifications: Receiver: 1. Frequency Range: 86 - 108 MHz 2. Reception Mode: FM 3. Distortion: =<2% Emitter: 1. Emission Frequency: 86 - 0.5MHz 2. Modulation Mode: FM 3. Emission Distance: >= 8m 4. Power: 2 x AAA Batteries or 4.5 DC (Not Included) 5. Dimensions: (6.3 x 3.15 x 7.09)" / (16 x 8 x 18)cm (L x W x H) 6. Weight: 431g / 15.2oz 7. 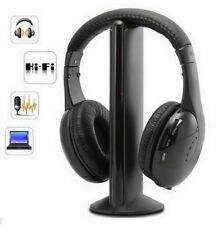 Impedance: 32Ω Package Includes: 1 x Wireless Headphone 1 x FM Transmitter (Stand) 1 x Audio Cable（CL118. Model:Stereo Headphones JCK-200 - Koss Corporation; Milwaukee WI. The AC adapter is NOT included, and because of this, the transmitter is untested. It is sold as used, and as is. Weight 0.312 kg / 0 lb 11 oz (0.687 lb). Also can be used with the KV-32FV27 and KV-36FV27 model Sony FD Trinitron WEGA TVs. Very Good Condition. Specifications: Receiver: 1. Frequency Range: 86 - 108 MHz 2. Reception Mode: FM 3. Distortion: =<2% Emitter: 1. Emission Frequency: 86 - 0.5MHz 2. Modulation Mode: FM 3. Emission Distance: >= 8m 4. Power: 2 x AAA Batteries or 4.5 DC (Not Included) 5. Dimensions: (6.3 x 3.15 x 7.09)" / (16 x 8 x 18)cm (L x W x H) 6. Weight: 431g / 15.2oz 7. Impedance: 32Ω Package Includes: 1 x Wireless Headphone 1 x FM Transmitter (Stand) 1 x Audio Cable（CL118）. Wireless infrared headphones for cord-free listening. Unwind with wireless audio that sounds great, just for you. Not compatible with plasma TV's. Muting function reduces noise when out of range. Self-adjusting headband for easy to use comfort. 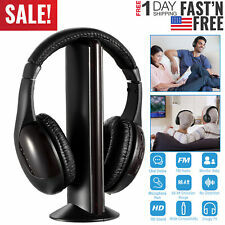 You cannot miss this 5 in 1 Wireless Headphones for MP3 PC TV Black which is really an ideal product for sports or other. active use! With this pair. FM radio function. of stereo earphones, you can enjoy maximum sound quality experience. 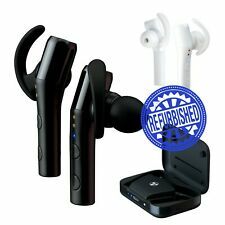 Sony Cordless Stereo Headphones MDR-IF0230 for Sony XBR Wega TV. 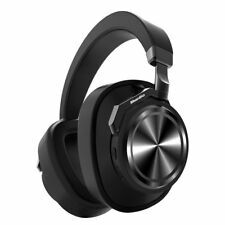 Almani HP1 Cordless Stereo IR Wireless Foldable Headphones. Enjoy brilliant sound on the HP1 IR Wireless Headphones by Almani. Totally hassle-free with no cords to get in your way. 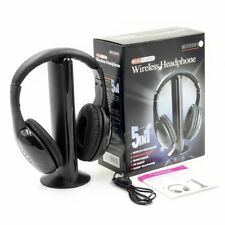 The wireless headphones are compatible with most Video/Audio Systems that have a built-in infrared transmitter. Wireless Earphone. disturbing others?. Use of the wireless earphone enables you to watch wonderful TV program. Equipped with audio cable ,the receiver can be used as a wired earphone. Wired Earphone. H-turbine also incorporate 4 languages voice prompt(Chinese, English, French, Spanish). Features: 1. Wireless net chat. It's perfect audio-chat tool, provides infinite enjoyment 2. FM radio function. The headset can be used as FM radio separately, search and lock channels automatically 3. Wired earphones. Equipped with audio cable, the receiver can be used as a wired earphone 4. Wireless monitoring. Place the emitter near baby, old people and sick people who need care, and the sound of the cared people can be heard with the receiver, for easy care Specifications: Receiver: 1. Frequency Range: 86 - 108 MHz 2. Reception Mode: FM 3. Distortion: =<2% Emitter: 1. Emission Frequency: 86 - 0.5MHz 2. Modulation Mode: FM 3. Emission Distance: >= 8m 4. Power: 2 x AAA Batteries or 4.5 DC (Not Included) 5. Dimensions: (6.3 x 3.15 x 7.09)" / (16 x 8 x 18)cm (L x W x H) 6:Weight: 431g. Reception from Audio, TV, MP3. Reception Mode : FM. Wireless Monitor---Place the emitter near babies, old people and sick people who need care, and the sound of the cared people can be heard from the receiver. With this pair of stereo earphones, you can enjoy maximum sound quality experience. For compact size and light weight, the headphones are also quite easy to carry and comfortable to use. FM radio function. Wireless Monitor: Place the emitter near babies, old people and sick people who need care, and the sound of the cared people can be heard from the receiver. Type Wireless Headphone. 1 x Wireless Headphone. powerbeats cordless headphones. Condition is Used. Shipped with USPS Priority Mail (1 to 3 business days). 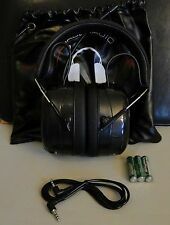 SONY MV-02HP Dual Channel Cordless Headphones. New In Box.. Never Used. Please ask any questions. Sales are final. Discounted shipping on multiple items. Then it's recharging! 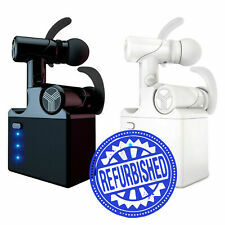 Just turn "On" the headphone and the transmitter, and you can use them directly, no need to pair them yourself. The foam padding on the headphones is falling abart/ crumbling. Otherwise all there. Wireless RF Headphones HiFi Over-Ear Headsets RF Transmitter Receiver w/ MicY-shaped Cable Monitoring Earphone 98.4ft Range for TV Radio CD. Providing you five functions (Wireless monitors, receiving clear sound when TV set mute function, search and receive FM radio channel, chat with your pen pal friends through inbuilt microphone, freely shift between wireless and 3.5mm wired earphone ).